Debs' Crafty Time: Long time no see!! How are you all doing? Loving these sunny days, whether it's warm or not! It's time I bit the bullet and share with you where I've been. As you all know when I last blogged in February I was undergoing a lot of tests and ill health. I kept filling up with fluid in my tummy which made me look 8 months pregnant. My wonderful GP was concerned that I could have a blood clot due to my chest pains that he wanted me admitted for tests. I wouldn't go that night but went the following day. I was told that day that I had Ovarian Cancer.I've undergone a full hysterectomy, appendix removed, a general good clear out. I am one lucky lady as they removed all the cancer and it hasn't spread - phew. We've had many sleepless nights waiting for results, but now we are on the next step of the journey. I start chemo next week for 6 sessions. 1 treatment every 3 weeks. I'll lose my hair and go through many symptoms but I am here, a tough cookie and so very lucky. I'd like to thank you all for your continued love and support. I used a Crafter's Companion die that I won a while back, twine, charm and gems. Apologies for not being able to leave you comments at the moment but I will still pop around for a peek when I can. Thanks for popping by to see me and for being patient with me. Gosh Debs..what a frightening time you have had and I am so happy that all has gone well for you. .all the best with your treatments, and then you only have the future to look forward to...take care. 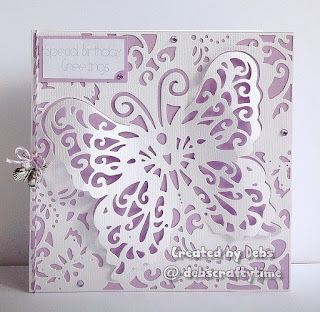 I love your beautiful butterfly card...just stunning. nice to see you back - but what a scary time you've had. and a beautiful card to arrive back in blogland with! So good to see you back Debs. Your card is beautiful, your hubby did you proud. Wishing you luck with the next stage of your treatment. It's nice to see you Debs and with such a beautiful card as well. I'm sorry to hear your news, thank goodness your Doctor was on the ball and got you in for tests straight away. I hope you continuing treatment is going well and you are soon back to full health. Wow! You have had a terrible time, thank goodness all has been attended to. Sending my love and best wishes for the next six weeks, having your chemo. You may or may not know Shaz handed Sparkles Christmas over to me, we all miss you on the blog, but I want you to know, your place on the DT is there for you when you feel like picking up the card making again. Again lots of love and we are thinking of you. Caz. Such a gorgeous card, and a elegant image love the colour you have chosen so pretty..